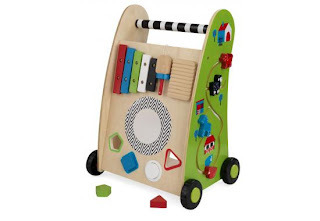 Our Push Along Play Cart by Kidkraft puts a tracking maze, a play xylophone, and a shape sorter all together into one adorable toy. On top of all of that, kids get to push it around from room to room as they play! Dimensions: 13.74" x 12.52" x 20"